The sun rises here at about 5:10AM, which is when I woke up. It wasn’t because there was any noise or disturbance or anything like that, it was just because that’s when I woke up. I threw on some clothes, grabbed a camera and went out on the balcony for a perfect view to the start of hopefully a beautiful day. There was actually someone sitting out a couple of doors down. At first I didn’t notice him in the darkness but then he farted loudly and that gave him away. I have seen sunrises in the Caribbean and Hawaiian Islands but few compare to what I saw this morning. It was stunning and will be forever unforgettable. 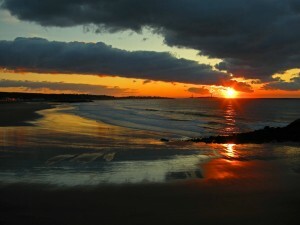 The cloud cover was just right and the colours of the arriving day were spellbinding. The sea is always an ideal setting for a spectacular sunrise or sunset and it did not let me down on this occasion. There were a few early morning walkers out and that only added to the tranquil scene. Gloucester was one of the first English settlements in what became the Massachusetts Bay Colony, predating both Salem and Boston. 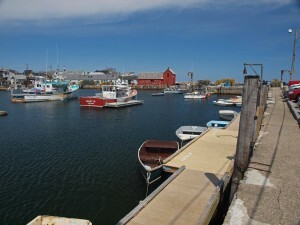 It is an important centre of the fishing industry and a popular summer destination on Cape Ann. Having said that, I did not find Gloucester quite as interesting as it sounds. It certainly is not bad and I enjoyed it very much but I found it difficult to find our way around and get to a specific area. It is one of those places where you can plainly see where you want to go but have a great deal of challenge finding a route to get there. I wanted to see the famous Fisherman’s Memorial statue, so with a next to useless local map in hand we set out in the van. Making an errant left turn instead of a right we suddenly found ourselves on Rocky Neck across the harbor from Gloucester. Oddly enough this was one of the spots I wanted to see today so I was quite pleased. 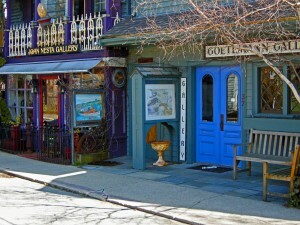 Rocky Neck is a spit of land housing an incredibly artsy population on Cape Ann. Artsy to the extreme – it makes Key West look like a formal royal ball. It is one of America’s oldest continuously working art colonies and has attracted some of the nation’s most illustrious artists. The Rocky Neck Art Colony is a non-profit organization comprised of artists, businesses and community members. Driving around the harbor seemed easy but somehow it became complicated and we ended up with the Fisherman’s Memorial statue in site totally by accident. We parked the van and walked along the breakwater sidewalk to where the statue rests. It is an 8 foot tall bronze statue of a fisherman dressed in oilskins braced at the wheel on the sloping deck of his ship. The base holds the inscription “They That Go Down To The Sea In Ships – 1623 to 1923” a memorial, along with plaques lining the walkway on either side, to all those lost at sea in this time frame. This memorial is very beautifully designed and an appropriate tribute. Outside of that I failed to see or comprehend a brochure’s description of Gloucester’s scenic harbour so we decided to head to Rockport to see if it was any better. Now finding both spots again was going to be the biggest challenge of the day because remember we got there by being a little lost in the first place and by accident in the second. I was indeed surprised that it was quite easy to find the parking lot on Rocky Neck but there was no sign of any key. Clearing my mind so I could make the same wrong turns again, we drove around the harbor and into Gloucester. Once again we quite readily found the spot on the side of the road where we had parked earlier and once again we saw no sign of any key. Just to be certain, Karen got out of the van and checked the grass boulevard more thoroughly. At first glance she thought, “No it can’t be,” but sure enough, there was the key in the grass! So a mission doomed to fail and bet against by both of us turned into an amazing Ripley’s Believe It Or Not moment. Wow – it’s a rare occasion when things work out this well for us. We stopped at one of the beaches to enjoy our homemade picnic lunch. It was a beautiful spring day and the number of people at the water attested to that. Sitting quietly, with just the sound of the lapping waves in the lagoon created by a sand bar, we feasted on our roast beef sandwiches and fruit. The view of the sand spit and ocean was relaxing as we sat back and watched the children and the dogs play. Following this wonderfully welcome interlude we drove north to Rockport. Once again the mysterious scale on our map came into play as we passed the access road to our motel and pretty much immediately saw the “Welcome to Rockport” sign. 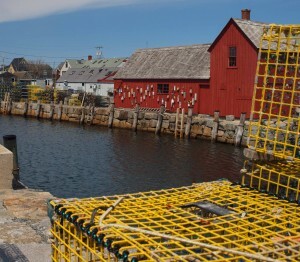 Rockport lies at the tip of the Cape Ann peninsula and is surrounded on three sides by the Atlantic Ocean. Until about 100 years ago it was simply an uninhabited part of Gloucester. Today it consists primarily of large estates, summer houses and a small fishing village. In 1856 a group of 200 women swept through the town and destroyed anything that contained alcohol. It became known as “Rockport’s revolt against rum” and effectively banned alcohol from the town. Except for a brief period in the 1930’s it remained one of Massachusetts’ dry towns. It remained that way for many years until it was recently voted that alcohol could be served in restaurants, but liquor stores are still illegal. What the hell? I can’t stay here! This is one incredibly busy little town although, as is typical with us, we have arrived here on an American holiday celebration. Unbeknownst to us, today is Patriot’s Day, a day celebrating “the shot heard ‘round the world” that started the American Revolutionary War. We eventually found a parking spot at the top of a hill in a residential area of town and had a very pleasant walk through the town down to the harbor. It is a very picturesque town and as we walked I had no trouble at all picturing people in those revolutionary times being observed today. Once again we found a wonderful spot virtually by accident. Both Karen and I were looking somewhat desperately for a washroom and were directed to the local harbour. Washroom duties completed we stepped out into a quaint little scene that reminded me oh so much of Peggy’s Cove, Nova Scotia. The colourful boats and surrounding shanty shacks gave it that nautical ambiance reminiscent of the fabled Nova Scotia setting. When we returned to the motel we had a quick nap, because after all, that’s what holidays are all about. A beach walk was planned right from the moment we arrived and it was a walk into the past for me. 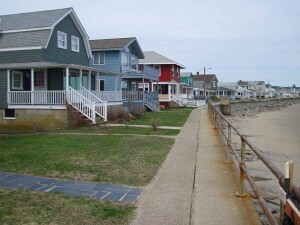 Obviously much has changed since 1958 when I first set my feet on the sandy banks of Cape Ann but the wide beach, the rocks and the old homes set back from the water still stick in my mind even after all those years.